Earlier this month, Centrica announced a major shift in its generation portfolio strategy. It intends to sell its large CCGT assets and re-focus on smaller peaking plant. A strategic shift of this scale from a well respected management team will no doubt fuel boardroom discussions across other European utilities. But the timing of the CCGT sales is interesting, given what are currently very depressed forward market conditions after a mild and windy winter. Earlier this month Centrica announced a major shift in its generation portfolio strategy. Centrica intends to sell all of its larger CCGT assets and re-focus on smaller peaking plant. A strategic shift of this scale from a well respected management team will no doubt fuel boardroom discussions across other European utilities. Weak CCGT returns are source of widespread pain. Centrica has justified the move based on the declining benefit of CCGTs as a hedge in its vertically integrated portfolio. Management has made no secret of the fact that it is structurally bullish gas prices. This is reflected in its major upstream investment program, where it presumably intends to re-invest some of the capital released from CCGT sales. Like many other utilities, Centrica is also pessimistic about the future recovery of gas plant margins. So the announcement of a downsizing of its exposure to gas plant is not a major surprise. However the timing of the CCGT sales is interesting, given what are currently very depressed forward market conditions after a mild and windy winter. In this article we take a look at Centrica’s asset sales and the forward market dynamics that will have an important impact on what prospective buyers may pay for the assets. Centrica intends to sell 2.7GW of larger CCGT assets, the Langage, Humber and Killinghome plants with a combined book value £500m. 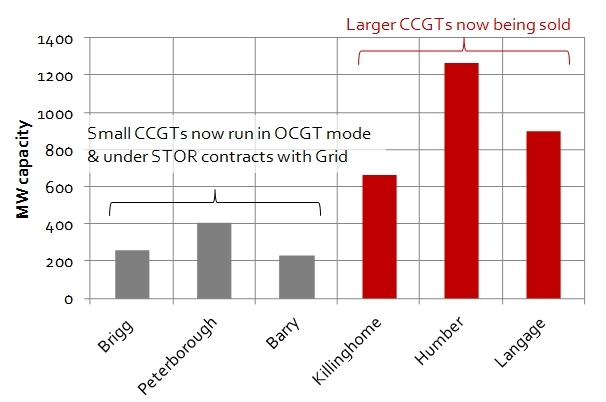 It intends to re-focus on its smaller gas plants which are currently running in OCGT mode under STOR (Short Term Operating Reserve) contracts with National Grid. However investment in these smaller assets is likely to be predicated on receiving adequate remuneration from the new Capacity Market (e.g. to cover plant refurbishment/upgrades). Otherwise Centrica has indicated that it will close these plants. The Centrica gas plant portfolio is summarised in Chart 1 below. Centrica’s strategic shift from CCGT to OCGT plants reflects the changing structure of the UK power market with the introduction of capacity payments. A shift towards remuneration for capacity vs energy favours smaller scale peaking assets as we described in an article back in April. CCGT margins may currently be very weak, but the 3 CCGT’s for sale represent an interesting mini generation portfolio with diversification across plant age, efficiency and cost structure. Value is focused on the newer Langage plant (commissioned in 2010). The other two plants are lower efficiency ‘dash for gas’ CCGTs from the 1990s, but assets which may offer interesting investment and Capacity Market options. Given the current weak spread environment and negative sentiment around gas plant, Centrica’s CCGT capacity is likely to price cheaply. What is unclear is whether Centrica will be willing to sell at these prices. Summer NBP gas prices have fallen by almost 30% (20 p/th) since the start of this year. We set out the drivers behind this price slump last week. While this fall in gas costs has slightly improved CCGT margins over the coming summer, this has been outweighed by a significant decline in forward power prices across the curve. The decline has been particularly pronounced in winter peak prices, in part reflecting the impact on expectations of the mild and windy winter that the UK has just experienced. Chart 2 shows a comparison of current forward sparkspreads vs those three months ago in February (at a market average 49.5% gas plant efficiency). A comparison of these charts shows that the gas price fall has done little to help CCGT owners. In fact indicative pricing further out on the curve (2017-18) shows spreads contracting significantly. We are wary of reading too much into these later year spreads given that liquidity is currently very poor. But it appears that any forward market expectations of CCGTs starting to displace coal in 2017-18 have disappeared with the government’s March budget announcement of a freeze in carbon price support. Although the fall in gas prices has improved CCGT competitiveness vs coal plant, a clear gap remains. 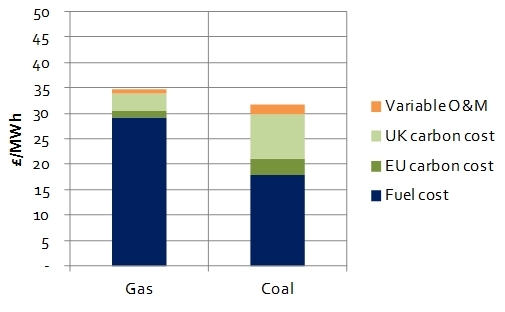 Newer CCGTs (52% efficiency HHV) are still about 3 £/MWh more expensive on a Short Run Marginal Cost (SRMC) basis than large older coal stations (36% efficiency) over the coming summer, as shown in Chart 3. That gap is equivalent to gas prices falling another 5p/th, coal prices rising 13 $/t or carbon rising 7 €/t. The CCGT vs coal plant SRMC gap blows out to around 8 £/MWh over the winter given higher seasonal gas prices. With peak power prices and forward spark spreads weakening and a clear competitive advantage to coal plant, this is a tough environment in which to sell CCGT assets. CCGT asset valuation has traditionally been focused around forecasting sparkspread margins. This is at best a risky exercise, given changing power market dynamics such as low carbon support, intermittency and capacity payments. And history has not smiled on bets based on bullish sparkspread forecasts. Getting comfortable with bounds on capacity pricing is of key importance to valuing CCGT assets, particularly older assets. If the Capacity Market is to prevent a security of supply crunch it will need to support older CCGTs to remain on the system by remunerating plant fixed costs. When new incremental capacity is required, capacity market returns may rise significantly above fixed costs. Capacity payments do not start until 2018, but payments represent a step change in CCGT margins and there will be visibility on capacity pricing when auctions commence later this year. CCGT energy margin exposure has also evolved with falling spark spreads. A CCGT asset is best characterised as a strip of options on the underlying spark spread. Plant fixed costs represent the cost of carry on these options. Under current market conditions, the return on these options is below the cost of carry for many assets (i.e. plants are making cash losses). But if the capacity market supports CCGT fixed costs then plant value dynamics change. What is important in valuing assets is capturing a realistic view of the flexibility (or extrinsic) value that can be monetised from plant optionality, both in the energy market and the Balancing Mechanism. This is a very different exercise from forecasting sparkspread scenarios (more details on CCGT extrinsic value here). Reserve margin has traditionally been icing on the cake. But it will play an increasingly important role in determining asset values as the UK market evolves. Ofgem’s reform of the Balancing Mechanism is set to drive much sharper price signals for flexible plant and Grid’s reserve payment budget will only rise over time with increased system intermittency. In our view, the investment case for UK CCGT assets is not materially impacted by the recent weakness in forward market spreads. There is still a solid investment case that can be built around a recovery in UK CCGT asset values over a 5 year horizon. But this depends on getting the right asset(s) at the right price and defining an effective asset monetisation strategy. Centrica’s willingness to part with its CCGT assets at low prices is not yet clear. But these assets sales may represent an attractive acquisition in what is currently a very depressed forward market.